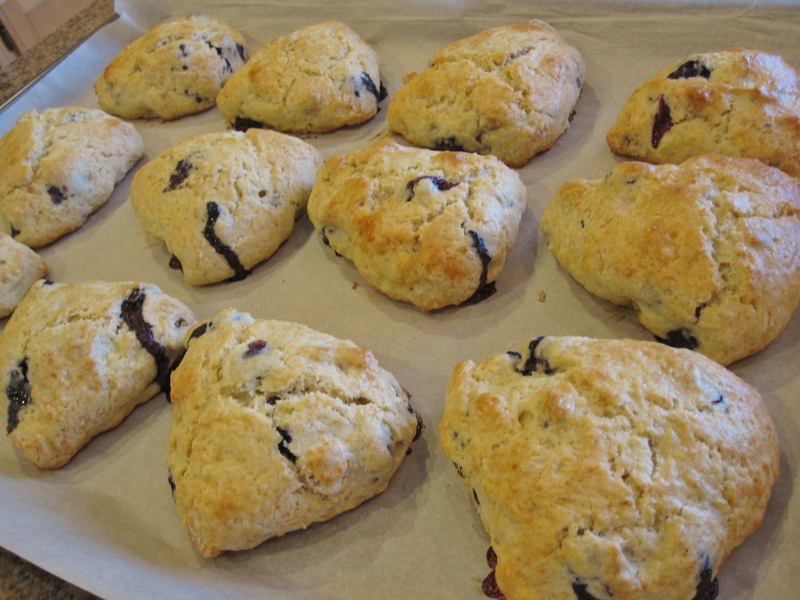 Place scones, 2 inches apart, on a baking sheet lined with parchment paper, and chill in freezer for 30 minutes (see note below). In the meantime, preheat oven to 400°F. Brush scones with reserved egg mixture and bake for 15-18 minutes, until the center is baked through and golden brown on the edge. Serve immediately. Fried crispy shallots is a common condiment in South East Asia cuisine– we add it to soups, rice and all kinds of dishes, and it instantly makes the dish a lot tastier. Frying shallots is a skill, from choosing the right type of shallots, slicing and to the frying. I love how the whole house smells after I fried shallots– it is just so incredibly aromatic. For those who are afraid of frying shallots at home, luckily it is becoming common in Asian grocery stores. Although the store bought ones are not as fragrant as home made ones, at least they are crispy. In a large bowl, mix flour, sugar, baking powder and salt to combine. Rub in cold butter with your fingers until the mixture resembles crumbles. Add in walnuts, cheese and fried shallots, mix well. Make a well in the center. 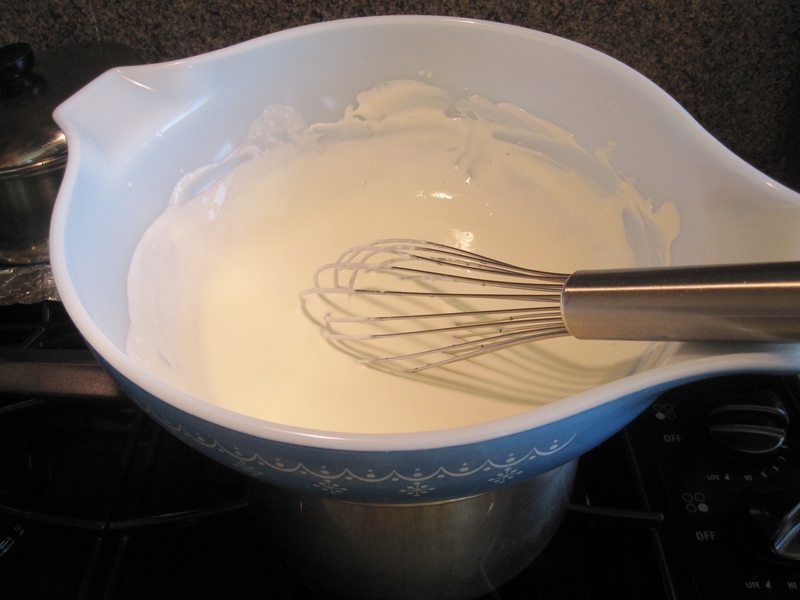 Whisk cream and eggs in a small bowl to combine. Scoop out 2 tbsp of the egg mixture for glazing. Pour the remaining egg mixture into the flour mixture. Using a spatula, mix until the dough just combined. Sugar: since this is savory scones, I used less sugar. Cheese: I like to use Asiago cheese, but you can use parmesan, cheddar or strong flavor hard cheese. 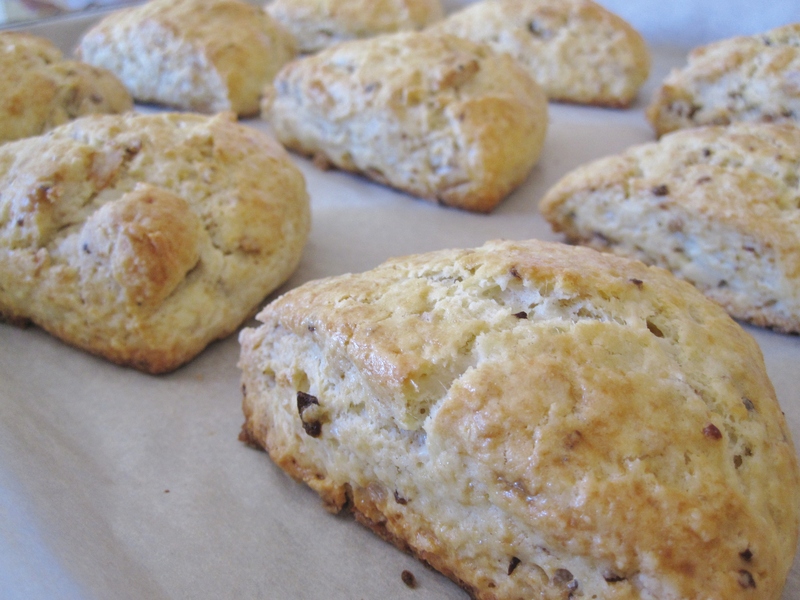 Flavor: the flavor of the scones is pretty much like the garlic shallot cookies that I made, but without the heat. If you want to spice it up, feel free to add in some crushed red chili flakes or fresh chopped jalapeno peppers. “Otak-otak” is a Malaysian food that is made of spicy minced fish paste (usually mackerel fish), wrapped between coconut leave fronds then charcoal grilled. In my hometown Muar, “otak-otak” can often be found in Chinese traditional coffee shops, where people always eat it along with some noodle dishes they order from other vendors selling food inside the coffee shops. There is even a bakery in Muar selling bake buns with “otak-otak” filling and the buns sold out fast. My family likes to serve it with steam rice as part of a meal, or make “otak-otak”sandwiches as a breakfast or tea-time snack. The typical fish for making “otak-otak” is mackerel. Years ago, I made my first “otak-otak” using mackerel but it didn’t turn out good. Back then I didn’t follow any recipe– it was really an experiment for me. This time I saw this recipe online and decided to give it a try because the picture of “otak-otak” looks just like the ones from my hometown. I happened to have some grouper fish leftover so I used it instead of mackerel. 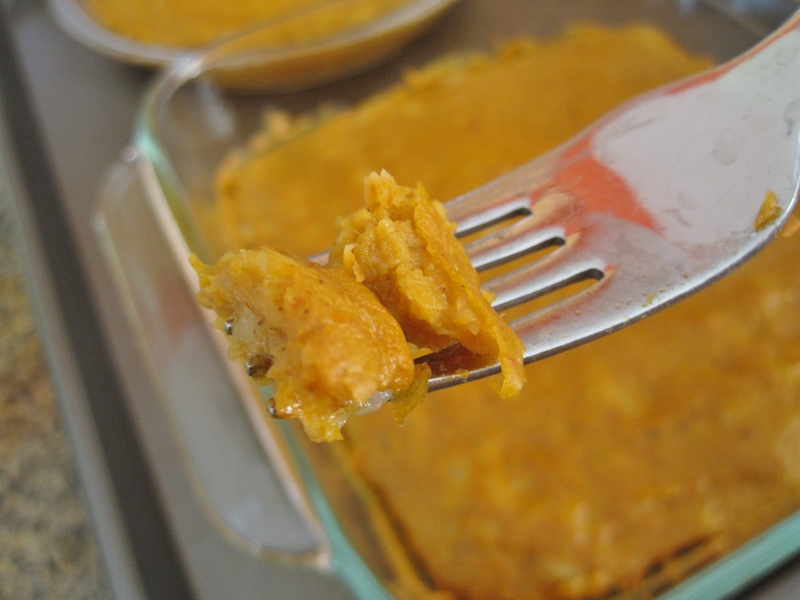 Actually this is quite an easy dish to prepare especially I always have sambal chili on hand– all I did was mixing chopped grouper fish, store bought fish paste, coconut milk and some spicy seasoning, then bake in the oven. Easy enough? Season minced fish with 1/2 tsp of salt, then mix with fish paste to combine. Add in seasoning and coconut milk, stir to combine well. Pour mixture into a shallow baking pan, smooth the top. Bake at preheated 400°F oven for 12-15 minutes. Fish paste: different brand of fish paste has different taste and texture (mushy soft or “bouncy” firm). 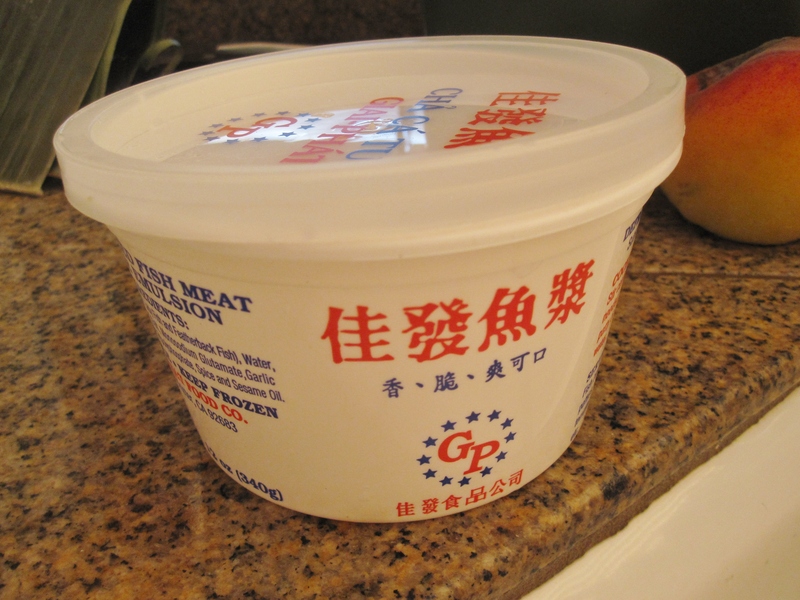 The one I used is a frozen fish paste sold in a plastic container brand 佳发鱼浆. This brand can be found in Foodnet Supermarket in San Leandro, CA or Marina Foods in Union City, CA. Minced fish: mackerel fish is typically used here. Or, you can use chopped small shrimps and make it shrimp “otak-otak”. 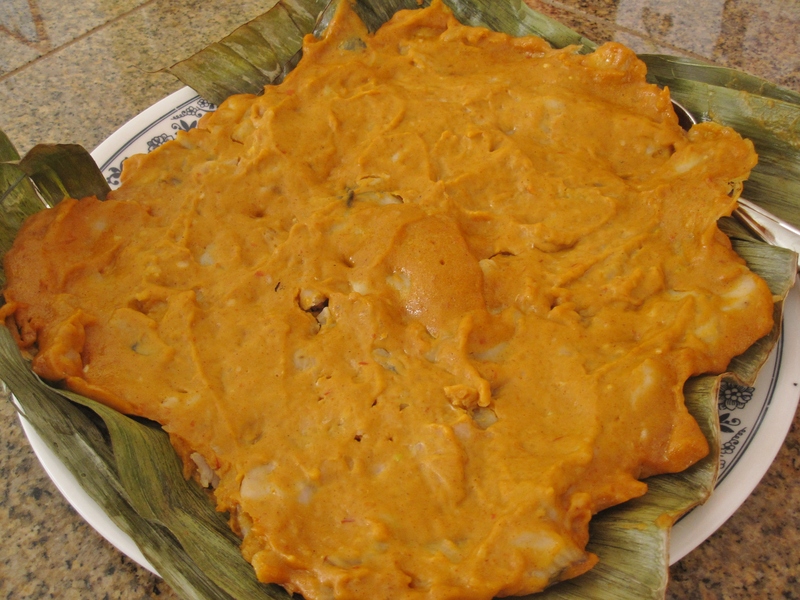 Wheat flour: wheat flour is used to produce a little firm texture to “otak-otak”. If a softer, mushy texture is preferred then use corn flour or tapioca flour instead. Taste the texture of fish paste first, then decide if wheat flour or corn flour should be used and adjust accordingly. Chili powder: chili powder is used to make it more spicy, and also gives a more vibrant color to “otak-otak”. Next time I should use “BABA” brand chili powder. 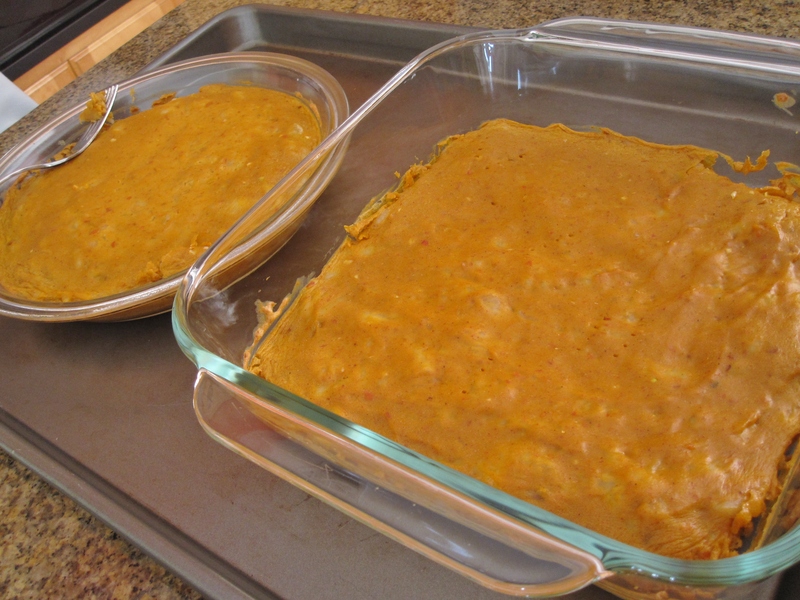 If you want the color but without the heat, use paprika powder instead. My “otak-otak” was dry and no sheen layer of oil on the surface– should try add may be 1 tbsp water and 1/2 tbsp oil to the mixture, and cover with foil before baking? Western cheesecakes are usually very rich and creamy in flavor, and dense in texture. But Japanese cheesecakes, on the other hand are creamy and lighter, and it suits Asians’ taste better. Years ago, when I made Japanese cheesecake it was a disaster– the top half of the cake is like a cake, but the bottom half is so moist and wet like a pudding! Since then it has been out of my mind, until recently I have all ingredients on hand, and decided to give it another try. Well, this time around my cheesecake turned out pretty good. I couldn’t wait for it to cool and chill, so I sliced a piece while it was still a little warm. I was kind of disappointed after the first bite– the cake is still a bit moist (at least it wasn’t like pudding moist this time!) compare to the store bought ones, but drier than the souffle cheesecake that I made before. I chilled the rest of the cake in the fridge and had some the next day. Guess what– the texture of the cheesecake turns out surprising differently! It is soft, light and yet a bit creamier than freshly baked– tastes just like those individually packed Japanese cheesecakes I bought at the Chinese grocery stores! Yes, finally I did it! 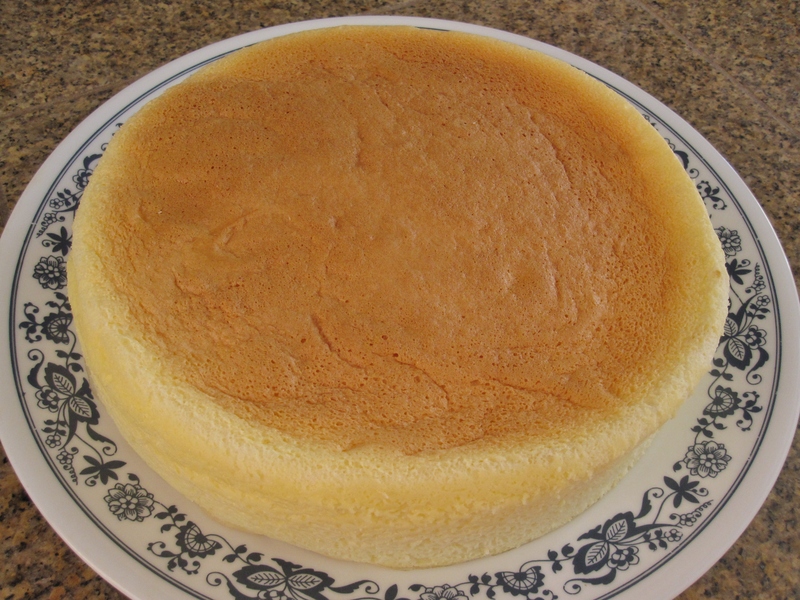 Cotton Soft Japanese Cheesecake– To leave a smooth edge after slicing, a serrated knife is needed. Position oven rack on the lower third of the oven. Preheat oven to 325°F. Grease cake pans. Prepare a deep roasting pan, and boil a pot of water. Melt cream cheese, butter and cream over a double boiler. Whisk until smooth. Set aside to cool. Sift in cake flour and tapioca starch to cream cheese mixture, whisk to combine. Mix in lemon juice ,grated lemon zest and egg yolks, one at a time. Stir to combine. In a different medium mixing bowl, whip egg whites until foamy. Add in cream of tartar and whip until the mixture resembles of very fine bubbles. While the mixer is on and turning, gradually pour in sugar. Whip on high speed until soft peak (curl tip when lifted) forms. Add 1/3 of whipped egg whites to yolk mixture. Use a balloon whisk to gently mix well. Then FOLD IN remaining whipped egg whites in 2-3 batches. 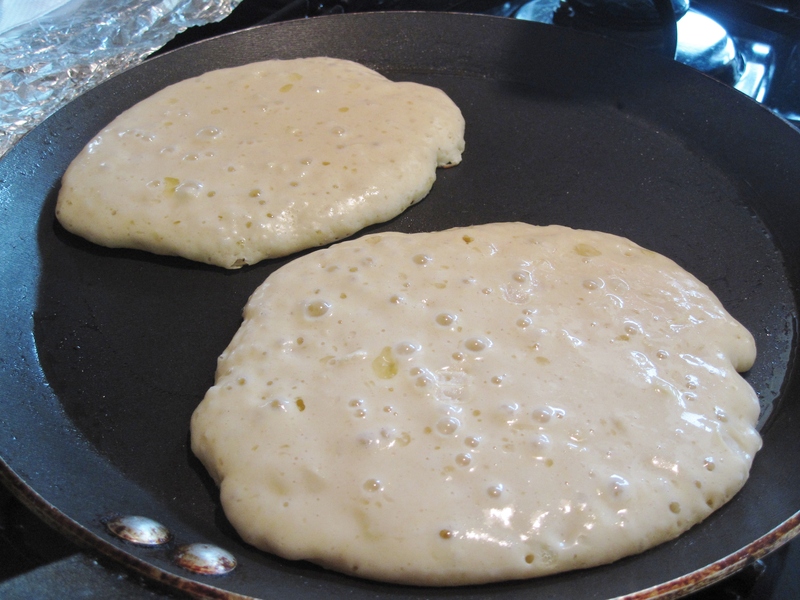 Pour batter to greased cake pans (about 70-80 percent full). Then place cake pans in a deep roasting pan. Carefully pour in boiling water into roasting pan. Water level should be about half the height of cake pans. Lower oven temperature to 300°F. Steam bake cheesecake at the lower third of the oven for 1 hour and 20 minutes. Turn off the oven and leave cheesecake in the oven for 1 hour. Cheesecake will shrink. Remove from the oven and cool completely. Chill the fridge before serving. The flavor and texture is at the best when it is chilled. To leave a smooth edge on the cake, use a serrated knife to slice the cake, wiping the knife clean after each slicing. 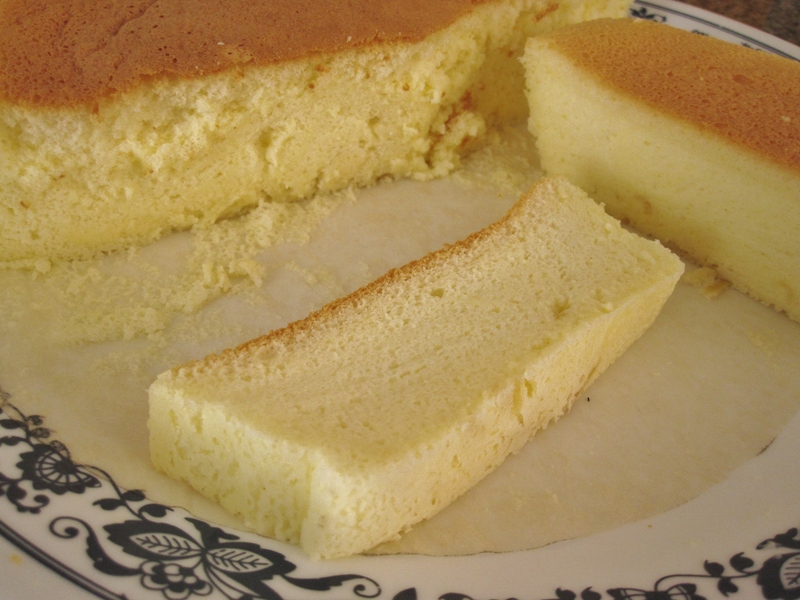 Cotton Soft Japanese Cheesecake– melting cream cheese, butter and cream over double boiler. 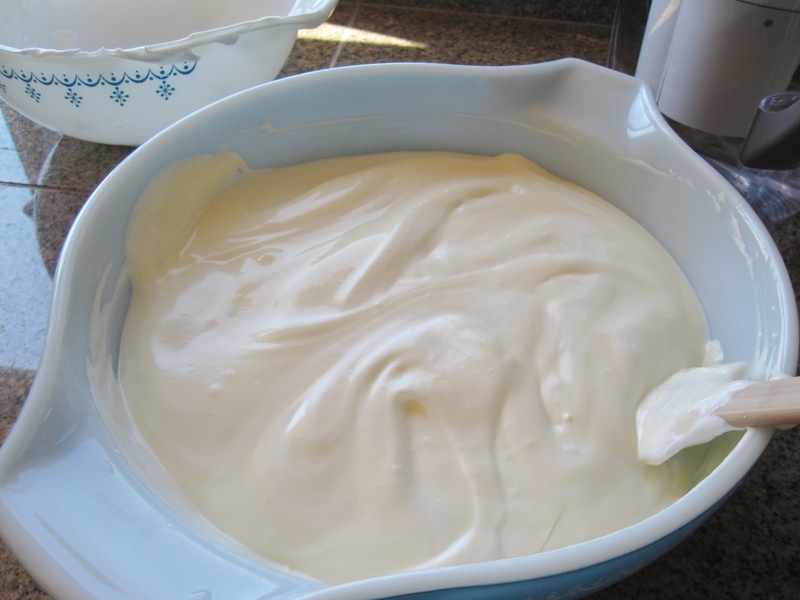 Cotton Soft Japanese Cheesecake– cheesecake batter after folding in whipped egg white. 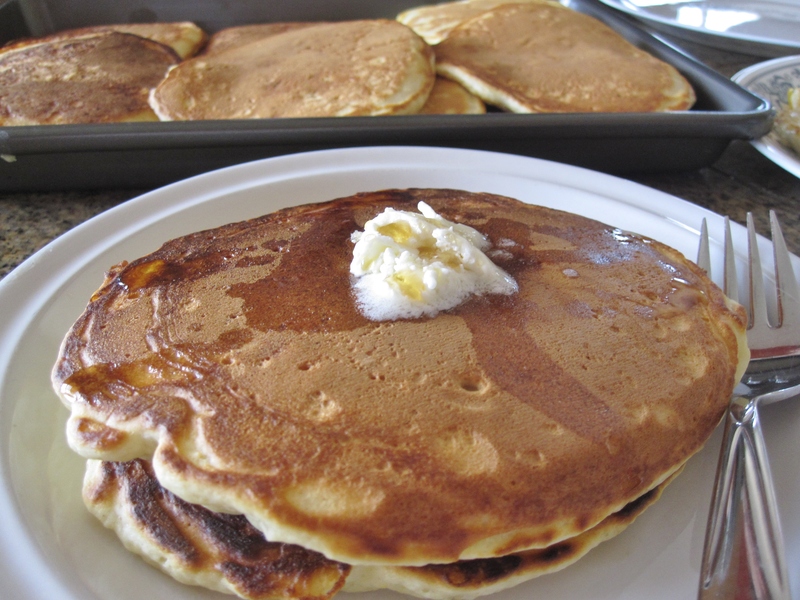 See how fluffy the batter turns out? 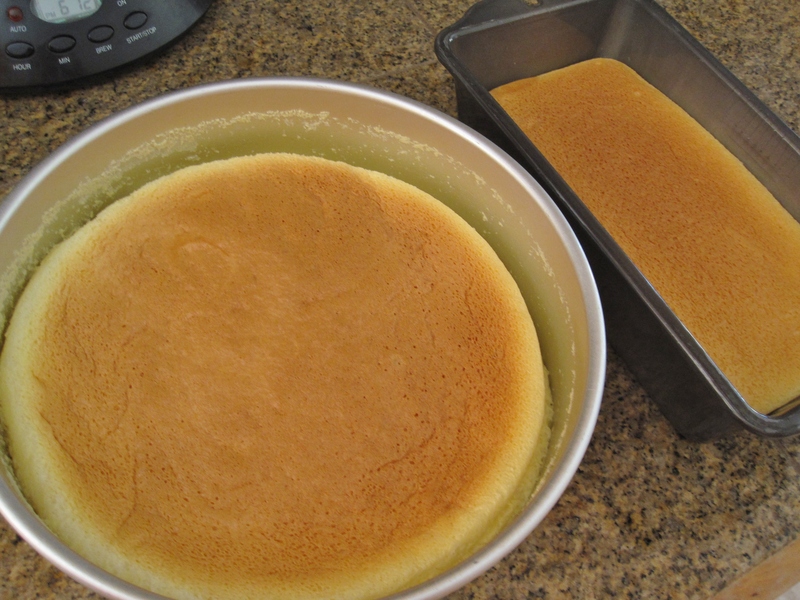 Cotton Soft Japanese Cheesecake– the cakes shrink after cooling in the oven.